Ohio’s Operating Standards for Identifying and Serving Students Who are Gifted requires school districts to conduct whole-grade screenings at least once in the K-2 grade band and at least once in the 3-6 grade band. Norton City Schools conducts the required whole-grade screenings in grades 2 and 4, screening specifically for superior cognitive ability, specific academic ability in reading and math, and creative thinking ability, as outlined by the operating standards. Superior Cognitive Ability: A student is identified as gifted in the area of superior cognitive ability when the student scores two standard deviations above the mean, minus the standard error of measurement, on an approved intelligence test, or performs at or above the ninety-fifth percentile on an approved composite battery of a nationally normed achievement test, or attains an approved score on an approved nationally-normed above grade level achievement test. Specific Academic Ability: A student is identified as gifted in the area of specific academic ability when a student performs at or above the ninety-fifth percentile in a specific academic ability field on an approved nationally-normed achievement test. Creative Thinking Ability: A student is identified as gifted in the area of creative thinking ability when a student scores one standard deviation above the mean, minus the standard error of measure, on an approved intelligence test and also attains a qualifying score on an approved checklist of creative behavior or creativity test. Visual and Performing Arts Ability: A student is identified as gifted in the area of visual and performing arts ability when a student demonstrates superior ability in a visual or performing arts area through a display of work, an audition, or other performance or exhibition and a qualifying score on an approved checklist of behaviors related to a specific arts area. Norton City Schools conducts whole-grade screenings for gifted identification in superior cognitive ability in grades 2 and 4. Currently Norton uses the InView and CogAT for whole-grade screening and assessment. Students whose results meet the qualifying score are identified as gifted in superior cognitive ability. Additionally, the district offers a re-assessment option for students whose scores reach a “rescreening” score. Parents will be notified in writing within 30 days of the receipt of testing results of their children’s identification or opportunity for rescreening. Whole-grade screening for specific academic ability in reading and math is conducted in grades 1, 2, 3, 5, and 7 through the use of NWEA MAP. The MAP assessment is administered three times during the year. The resulting scores of each administration are reviewed, and students whose scores reach the 95th percentile (national percentile rank) on the reading and/or math are identified as gifted. Whole-grade screening for creative thinking ability is conducted in grades 2 and 4 through the use of InView. Students whose results meet the qualifying or rescreening score will then have their creative abilities considered through an approved checklist of creative behaviors. Students whose InView and checklist scores reach qualifying scores will be identified as gifted. Students whose InView scores and/or checklist scores reach the score for rescreening will have the opportunity for reassessment. Screening and consideration of identification in visual and performing arts ability is conducted upon parent, teacher, or student referral. A checklist of behaviors related to the specific arts area will be completed, and if a qualifying score is achieved, then a demonstration of superior ability in the area of visual and performing arts will be scheduled, with the student performing an audition or displaying work through a portfolio or other exhibition before trained assessors. The district also offers opportunities for gifted screening twice per year in accordance with Ohio’s Operating Standards for Identifying and Serving Students Who are Gifted. Referrals may be made by teachers, parents or legal guardians, guidance counselors, administrators, gifted intervention specialists, and students. Norton City Schools offers services to students identified as gifted in reading, mathematics, science, and superior cognitive thinking. All students are served in their area(s) of identification. Grades 1-4: Students in grades 1-4 receives services in their area(s) of gifted identification in their classrooms, placed in cluster groups working with teachers who are receiving ongoing professional development and support from the district’s gifted coordinator. Grades 5-8: Students in grades 5-8 are served in a number of ways, including cluster groups, honors classes, and/or accelerated classes. All teachers receive ongoing professional development and support from the district’s gifted coordinator. Grades 9-12: Students attending Norton High School are served through cluster groups, Honors classes, AP classes, and/or CCP options. Teachers at Norton High School receive ongoing professional development and support from the district’s gifted coordinator. Parents may choose to withdraw their children from gifted services by sending a request to the child’s building principal and the district’s gifted coordinator. A phone call or meeting may be requested to discuss the concerns prompting the request for removal from services. Acceleration is the practice of assigning a student to a higher grade level (whole-grade or subject) or admitting a student to kindergarten earlier than is typical for the student’s age. The purpose is to provide appropriately challenging learning opportunities for students who need them. Whole-grade acceleration is defined as assigning a student to a higher grade level than is typical for the student’s age. For example, a student finishes first grade and then begins the next year in third grade. This typically requires an extensive process including a variety of assessments and evaluations. These are completed with the goal of ensuring the whole-grade acceleration is appropriate and in the best interests of the student. Subject acceleration is defined as assigning a student to a higher grade level in a particular subject than what is typical for the student’s age. For example, a student in fifth grade student performing above grade level in math takes sixth grade math, while all other classes are taken at the fifth grade level. There are many factors reviewed in the process of making decisions about subject acceleration, including reviewing performances on a variety of assessments. Early admission to kindergarten is when a student is admitted to kindergarten when he or she has not yet reached the typical age at which students are admitted to kindergarten, with the purpose of providing access to appropriately challenging learning opportunities. Early entrance to kindergarten requires extensive assessment and evaluation to ensure the early entrance is appropriate and in the best interests of the student. 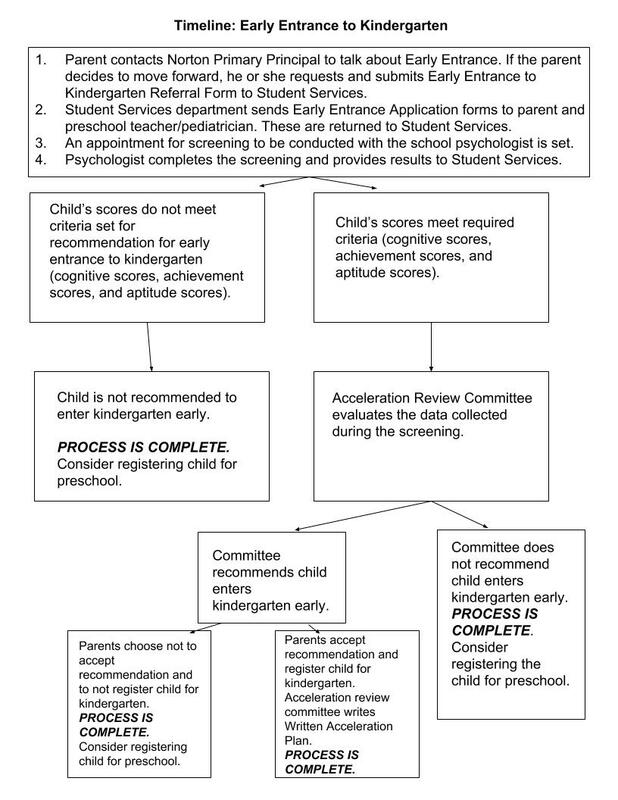 For more information about the process used in Norton City Schools, please refer to the flow chart shared here. You may also visit the Norton Primary School web site and contact the building principal for more information. Acceleration is a practice that can be used with any student, whether identified as gifted or not. Not every student identified as gifted is accelerated, and not every student who is accelerated is identified as gifted.